Provide comfort for the family of Elsie Boese with a meaningful gesture of sympathy. Elsie (Hynek) Boese died peacefully in her home on Friday, December 7th, 2018 in West Allis, Wisconsin at the age of 100 years and 11 days. Elsie was born on November 26, 1918 in Hillsboro, Wisconsin to Anton and Mary (Siroky) Hynek. She graduated from Hillsboro schools and was active in Girl Scouts. After moving to Milwaukee for work, she met Harvey Boese at a dance. They were married on September 7th, 1946 at First Lutheran Church in West Allis. Elsie began working for Veteran’s Administration as a secretary, retiring at age 55. Elsie traveled extensively with her brother Jim and his wife Dorothy to many countries on several continents. She beat everyone at Rummikub and stayed active by volunteering at Mitchell Manor, as an election judge, and participating at the West Allis Senior Center. 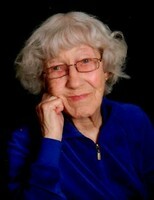 Elsie was a faithful member of First Lutheran Church in West Allis for 72 years. She loved the Brewers, the Packers, and had a special place in her hearts for dogs. Elsie is survived by her nephews Bob (Pat) Sullivan and Steve (Dala) Hynek; nieces Patricia (Pat) Miller, Judy (Jon) Molzahn, and Susan (Steve) Lakics, many great nieces and nephews and friends, including much appreciated neighbor, Don Walloch. She is preceded in death by her parents, husband, sister Bessie Sullivan; brother, Laddie Hynek; and sister-in-law Dorothy Hynek. Elise and her beloved brother, Jim, died on the same day. A funeral is scheduled for Friday, December 14th. Visitation will be at 10:00 am with the service following at 11:00 am at First Lutheran Church, 7400 W. Lapham St., West Allis. Pastor Byrant Bakkum will officiate the ceremony. In lieu of flowers, the family is requesting that donations be made to First Lutheran Church in West Allis in her honor. Elsie will by laid to rest in Highland Memorial Park Cemetery in New Berlin, WI, next to her husband and her beloved in-laws. To send flowers in memory of Elsie Mary Boese, please visit our Heartfelt Sympathies Store.